Knowledge-intensive Processes (KiPs) are unstructured processes that demand an understanding beyond control flow and data. Being knowledge-centric and varying at each instance, KiPs demand new perspectives for proper process analysis. 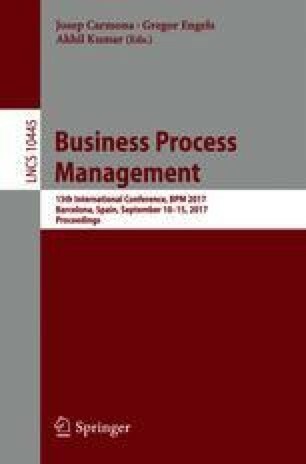 Most KiPs have strong collaboration characteristics, where interactions among participants are crucial to achieve process goals. Process participants perform activities and collaborate with each other, driven by their Beliefs, Desires and Intentions; therefore, the analysis of these elements is vital to the correct understanding, modeling and execution of a KiP. This research proposes a method based on Speech Act Theory and Process Mining to discover the flow of speech acts related to Beliefs, Desires and Intentions from event logs, and shows how this relation fosters process performance analysis. The approach was evaluated through a case study in a real life scenario, and results showed that relevant insights in forms of speech acts flow patterns were discovered and related to performance issues of the KiP. F.A. Baião–partially funded by the CNPq brazilian research council, project 309069/2013-0. F.M. Santoro–partially funded by the CNPq brazilian research council, project 307377/2011-3.